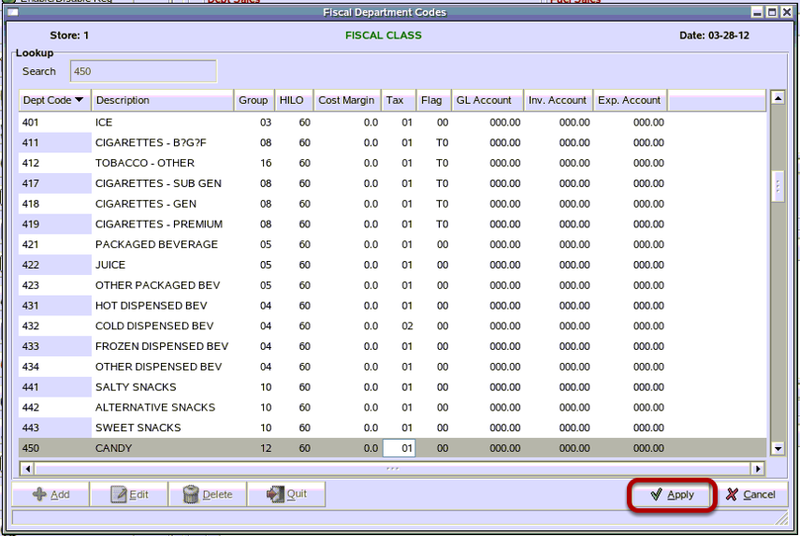 TravStar1 Point Of Sale SystemManager's Work Station Additional SetupHow Do I Assign a Tax Rate to a Group Of Items? How Do I Assign a Tax Rate to a Group Of Items? This lesson will teach you how to assign a tax rate to a department so that all items within that department get the same tax percentage. 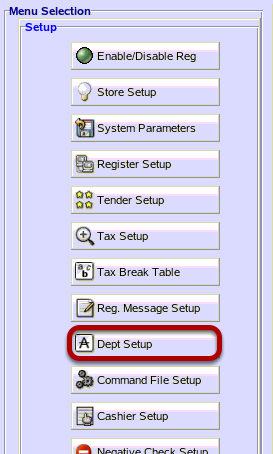 From the setup menu, click on the "Dept Setup" button. 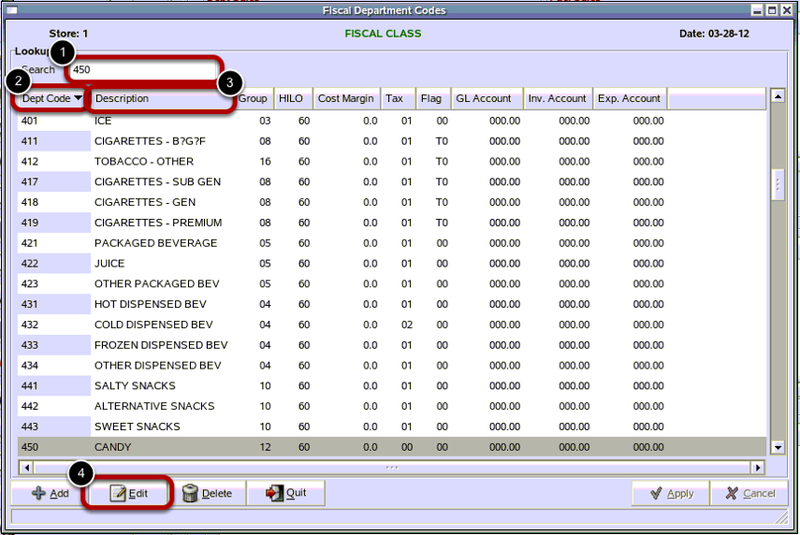 1) To search for a department number, click in the Search field and type in the Department Number. Department numbers are always 3 digits. 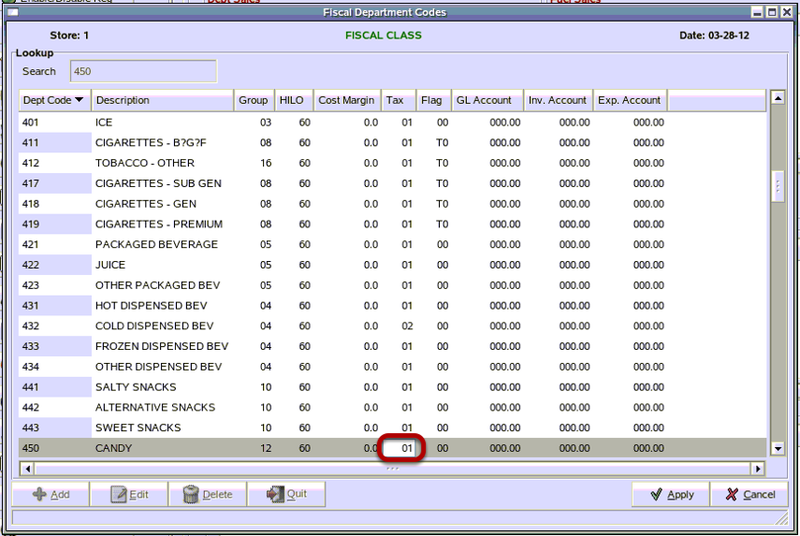 For example: 001, 101, 201 are all valid department numbers. 1 would not be a valid number number. 2) By clicking on the column heading, you can change how you are searching through department list. To search by the department description, click on the 3) Description heading. 4) With the department you wish to edit highlighted, click on the "Edit" button. Click in the Tax field for the department you wish to edit and type in the Tax Code for this department. We are assigning this to Tax Code 01. Click on the "Apply" button to save your changes. Now that you have made your changes, you will need to send this file to the register. See the lessontitled How Do I Setup And Send Commands To The Register? For further information about changing Tax Codes and Tax Rates, see the lesson titled How Do I Change My Tax Rate? Prev: How Do I Change the Tax Rate? Next: How Do I Change the Information on POS Receipts?